Ganesh Venkatraman became a household name after his stint at the 'Bigg Boss' house. He was one of the four finalists of the first season of 'Bigg Boss'. Meanwhie, there's some happy news at his household. His wife, Nisha Ganesh is pregnant, and the couple is awaiting the newest member of their family. He took to Twitter, saying “Welcoming d soon to come 'New Arrival' in d family & seeking blessings fr my love @Nishaganesh28 wit a traditional Seemandham. Excited abt this New Phase of life 'Fatherhood'.Time to grow up myself”. He also posted pictures from the ‘Seemandham’ function held at his residence. The couple looked cute together, and they are indeed giving out couple goals. Everything said, we from Behindwoods congratulate the couple for this next phase of their life. 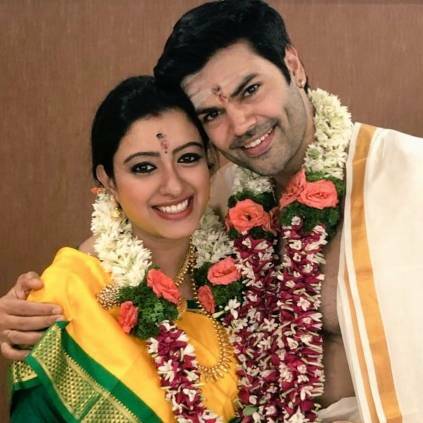 People looking for online information on Ganesh Venkatraman, Nisha Ganesh, Nisha Ganesh pregnant will find this news story useful.